Precious metals futures kicked off the new trading week with losses on Monday that ranged from less than 0.1% for gold to 2.3% to platinum. Gold for February delivery dipped $1.20 to settle at $1,331.90 an ounce on the Comex division of the New York Mercantile Exchange. "Gold is shaking off an upside bounce to the dollar and looking at the possibility of a government shutdown," MarketWatch quoted Bob Haberkorn, senior market strategist at RJO Futures in Chicago. 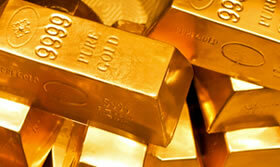 Gold futures traded from a low of $1,328 to a high of $1,335.80. They edged 0.1% lower last week, snapping a string of five weekly gains. Meanwhile, silver for March delivery lost 4.7 cents, or 0.3%, to settle at $16.989 an ounce. Silver futures ranged from $16.94 to $17.11. They declined 0.6% last week. April platinum dropped $23.30 to $996.80 an ounce, trading between $994.80 and $1,023.90. Palladium for March delivery declined $6.10, or 0.6%, to $1,092.30 an ounce, ranging from $1,078.30 to $1,105.45. Last week, platinum rose 2.4% while palladium fell 0.6%. Gold declined $2.35, or 0.2%, to $1,332.60 an ounce. Silver slipped a half penny, or less than 0.1%, to $17.035 an ounce. Last week in LBMA precious metals prices, silver fell 0.5% while the other metals posted advances of 0.6% for gold, 2% for platinum and 1.3% for palladium. United States Mint bullion sales advanced by a combined 9,000 ounces in gold coins and by 250,000 ounces in silver coins. Below is a sales breakdown of U.S. bullion products with columns listing the number of coins sold during varying periods.